Do you know when the countdown to 100 days till Christmas starts? Its September 16th of this year. 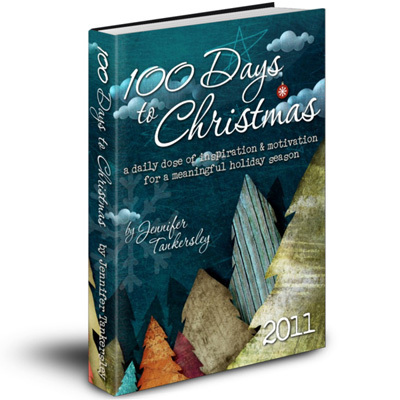 Jen over at ListPlanIt has been running the 100 Days to Christmas website since 2008. Its a great interactive community to get you in the mood and stay on task as you head into the fall season. I found out about it last year. I received an advance copy of 100 days to Christmas 2011 eBook. For those that want to have a portable copy to read at any time, this ebook has all the features. The book is full of tips and tricks to get you thru the whole season. It's not just about christmas its also for transforming your home as fall rolls in, Halloween prep, Thanksgiving menus and how far out to plan it. Each week there is a task, a deadline and there are frequent links to take you back to either the appropriate list on ListPlanIt or Pinterest for visual ideas. This really is an all inclusive guide. I loaded my copy on my nook for easy reading. The copy i received unfortunately was not a nook copy so the formatting was off, but the Nook and Kindle copies are now live and available for purchase. The book is $4.99, but if you buy a new membership from ListPlanIt the ebook is free. Disclaimer: I received an advance copy for free in exchange for reviewing it. The opinion of the book are my own.